Language is one of the biggest barriers to making information universally accessible, and we’ve been working to make increasing use of machine translation to improve search across languages. This is especially important for languages with less prevalent local language content available online. You should also get the most relevant information regardless of the language you’re searching in. We use machine translation to translate your search, find the pages that best answer your question and translate the relevant results for you. You’ll start to see relevant English-language pages when you’re searching in one of 14 languages: Afrikaans, Malay, Swahili, Serbian, Slovak, Macedonian, Slovenian, Norwegian, Hindi, Catalan, Maltese, Icelandic, Welsh and Albanian. If you click on the main result title, you’ll get to the original English-language page, while the translated link underneath will take you to a translated page. We hope this will help you find the information you need, no matter what language it’s in. English speakers take it for granted that they can always find answers online, regardless of their search topic. But what if you speak Hindi, Welsh or Afrikaans? The amount of content available online per speaker for Hindi is just 1% of the vast content out there on the web per English speaker. So if you speak one of the languages with less online content, some of the most relevant results for your search may actually be in English. To help break down that language barrier between you and the answers you need, starting today you may see relevant results in English in addition to those in your default language. 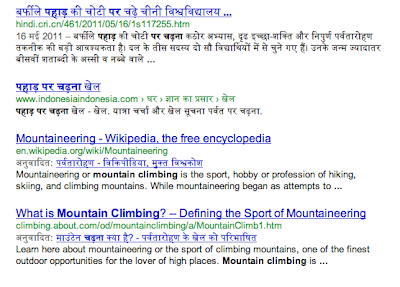 For example, let’s say you speak Hindi and want to find information on mountain climbing -- we want to help you also find the relevant pages in English and for these, you’ll also see a translation into your language.